Alyssa Alger, 31, has built Alger Designs from the ground up since she was getting her master’s at the University of Arizona. Now Alger balances being an instructor of dance at Southeast with running her own small business. Besides being an instructor of dance at the River Campus, Alyssa Alger has a business she owns and operates from her home designing and making leotards. 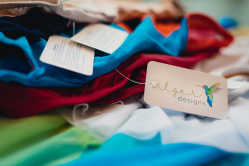 Alger Designs provides numerous vibrant and detailed leotards for dancers locally and internationally. While she said her average consumer is typically students in the dance program at Southeast, she has a loyal customer from Taiwan who regularly orders from her online Etsy shop. The Grass Lake, Michigan, native earned her bachelor’s degree in dance from Mercyhurst University, formerly known as Mercyhurst College, in Erie, Pennsylvania, and her master’s degree in dance with a concentration in choreography from the University of Arizona. The Alger Designs hand painted logo is seen on a tag attached to a leotard made by Alyssa Alger on Thursday, March 21 at the River Campus. Alger stitched up her first leotard when she was in graduate school in Arizona and needed some extra money, she said. “I wasn’t able to hold down a full-time job because I was in rehearsals all day,” she said. Alger said her mom was shocked when she informed her about the idea. 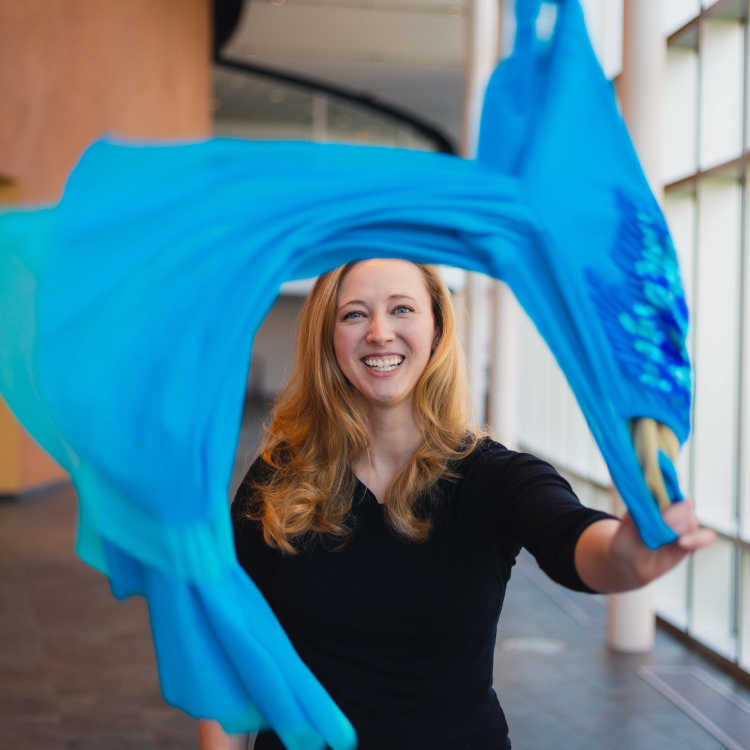 Southeast dance instructor Alyssa Alger holds up several of her handmade leotards Thursday, March, 21 at the River Campus. She first learned how to stitch leotards by hand before she made the decision to purchase both serger and coverstitch machines to make things easier on herself. Once the sewing machines came into play, Alger said the business exploded. The very same machines she purchased in graduate school are the ones she makes leotards with today. Southeast dance instructor Alyssa Alger poses with several of her handmade leotards Thursday, March, 21 at the River Campus. “I desperately need new ones, but they’re still kicking,” she said. When Alger says she was self-taught, she means it — she never once has used a pattern that she didn’t conjure up herself. She never intended to sell her first leotard, although she ended up selling it to a friend. Alger’s graduate program surrounded her with people who were willing to test out the leotards. Alger said she tries to design dancewear flattering for multiple body types. “I like trying to find ways that I can design custom dancewear that has enough customization to it that it'll serve a variety of dancers and body types and body shapes,” she said. Alger Designs recently went through some rebranding. Alger believes in supporting local and small businesses, so everything about her business and brand is locally sourced besides the material she uses to make the leotards. Abby Petzoldt — who is the mother of Grace Petzoldt, one of the students in the Conservatory Dance Academy — designed and hand painted the hummingbird logo for Alger Designs. Alger said one of the things that comes with owning a small business is there is always a slow season and a busy season. During her busy seasons, she has been able to recruit Southeast students from the River Campus to help make leotards. Alger is considering creating athletic wear in the future. Some must-have items on Alger’s idea list are high-waisted leggings that are both “squat-proof” and provide pockets, and tops that are neither boxy or form-fitting. “So all of those things are ideas that I've got going, I just haven't haven't taken that step yet,” she said. Anyone interested in Alger Designs can visit the Etsy shop at etsy.com/shop/AlgerDesigns.